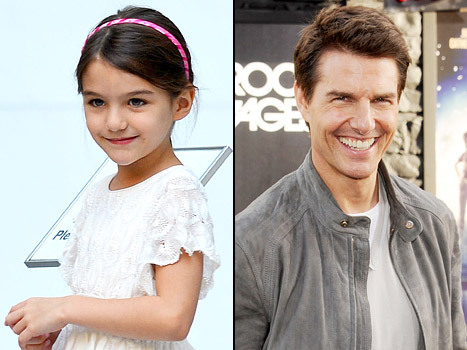 Katie Holmes can’t stop Tom Cruise from seeing his daughter any longer. The actor, who has kept his distance from Suri Cruise following the news that he was splitting from his wife, has told family members he wants to spend time with his daughter over the Christmas holidays, considering it’s the most important time of the year where family gathers together and spend time with each other (and eat a lot of food, of course!). Cruise has been trying to work out when he can see Suri now that Katie has moved to New York, where she had filed the divorce papers over the summer. Tom lives in Los Angeles and doesn’t have a problem flying back and forth, but his jobs on different movies have kept him apart from Suri in recent months. Despite all of this, there is no way that Tom will not find time for Suri over Christmas. In fact, he has already confirmed he will be with Suri. Cruise’s confirmation that he will be with his daughter later this month comes just days after it was believed his plans were to fall through. Meanwhile, Katie seems to have moved on quickly after being spotted with a new man by her side, and the two were caught kissing together, too.